We are sad to report that a bull buffalo was recently shot by the Montana Department of Livestock (DOL). The buffalo was killed by DOL agent Jeff Mount on July 14, just outside of Gardiner, Montana near Yellowstone's northern boundary. BFC did not report this tragedy in the last Update because the DOL denied knowledge of it happening and we were therefore unable to confirm it. After further investigation, BFC learned from Montana Fish, Wildlife & Parks (FWP) that the rumor was, indeed, true. 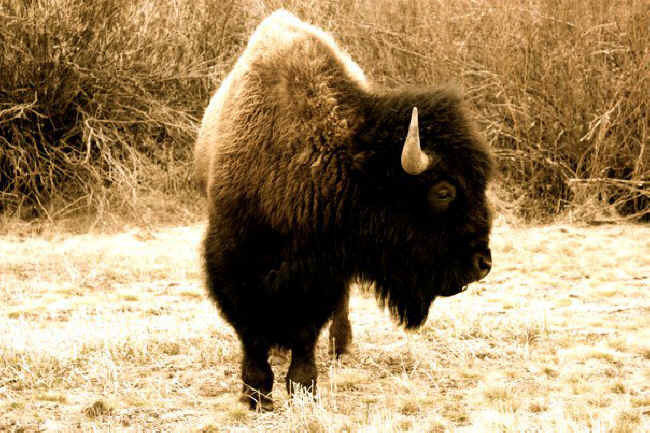 Apparently, the bull had walked to the Corwin Springs buffalo quarantine facility, not very far from Yellowstone's boundary, where wild bison stolen from their Yellowstone home range have been imprisoned for over five years. The captive buffalo were excited by the presence of their wild relative, and they busted through the inner fence of the facility. Apparently, DOL agent Jeff Mount attempted to haze the bull away from the area, but soon decided to shoot him. This incident underscores the strong family ties of buffalo; we hold little doubt that the bull was trying to set his relatives free. BFC and the Gallatin Wildlife Association had contacted the DOL about this incident over the course of a few weeks, with no information gained from the livestock agency. Due to the DOL's lack of transparency in this situation, and more frankly, their lies, BFC has taken legal action by formally filing a Right to Know Request with the agency, a state version of the federal Freedom of Information Act. The DOL's refusal to acknowledge this drastic action is another testament to their deceitful nature, especially in regards to wildlife. They are a rogue agency that thinks they are accountable to no one. Why would they try to hide killing the bull? Since they denied knowing about the incident, what, exactly, happened with the meat, head and hide of the bull? We will find out and let you know. If anyone reading this Update was in the Gardiner area on July 14 and remembers seeing this bull, please share what you know with us. The Interagency Bison Management Plan cohorts met early this week, with BFC and other bison advocates in attendance. A tour of lands favored by the buffalo along Yellowstone's western boundary was conducted, and while the public was invited to attend, we were prevented from speaking, or correcting misinformation. Of course, one rancher who doesn't like buffalo - Pat Povah - was able to speak freely throughout the entire tour. Interestingly, the Montana Department of Livstock - the agency driving the infamous IBMP - did not have any real representation, not even the local DOL agent, Shane Grube, was present. Their interests were snugly represented by hobby rancher Pat Povah. That evening, there was a public forum organized by locals, and the following day, the IBMP agencies met in Bozeman, Montana for the usual working meeting. Look for a full report and photos from us in the next Update. BFC continues our summer outreach program inside Yellowstone and Grand Teton National Parks, talking with Park visitors about the current plight of America's last wild bison population. This has always proven to be a bit of a challenge for BFC, because the Park requires that groups apply for a "free speech permit" and would designate a specific area - a "free speech zone" - where we could table, usually well out of the way of frequently visited areas. The entirety of the United States is supposed to be a free speech zone, and these requirements are a violation of our constitutional, first amendment rights. This permitting process has been challenged in court for what it is: unconstitutional, and just this week, the U.S. Court of Appeals ruled that national parks can no longer require permits for free speech.